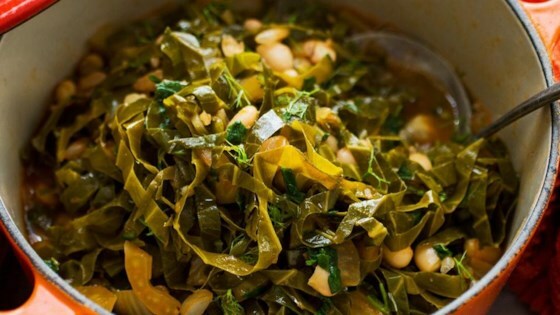 "This is a delicious twist on a soul food staple! They are never bitter. I got the recipe from a Liberian restaurant. You may think the ingredients are strange, but they come together perfectly. You may want to adjust the amounts to your taste. When cooking something like greens, eyeballing is the best measurement. The longer you cook these, the more the flavors mesh and the better they taste." Place the bacon in a large deep skillet and cook over medium-high heat, turning occasionally, until evenly browned, about 10 minutes. Drain the bacon slices on a paper towel-lined plate and crumble. Heat collard greens, vegetable oil, water, and chicken bouillon in a large pot over medium heat. Simmer until greens are wilted, about 10 minutes. Stir bacon, peanut butter, liquid smoke, soul food seasoning, cayenne pepper, salt, and black pepper into pot; cover and simmer until greens are very tender and peanut butter begins to separate, about 1 1/2 hours. Add more water if the mixture becomes too dry. Stir flounder fillets into greens. Continue to cook until fish breaks down, about 30 minutes more, stirring frequently. I’m confused about the comments. This is a collard greens recipe and says nothing about flounder. Mixed reviews by my those at the table but I really enjoyed as a change of pace and plan to make again and serve over rice or potatoes as a meal.